Chelsea are scheduled to face Tottenham Hotspur in the second leg of the League Cup semi-final on Thursday night. The Blues are currently facing a 1-0 deficit from the first leg on the road but they have the opportunity to make amends and progress to the final. Kepa Arrizabalaga has been preferred during the latter stages of the League Cup and he should keep his position between the sticks. In defence, the personnel should remain unchanged from recent months with Cesar Azpilicueta, Antonio Rudiger, David Luiz and Marcos Alonso making up the backline. In the midfield, Jorginho and N'Golo Kante should keep their places for the derby despite the fact that the former has received criticism from the supporters after his no-show against Arsenal. Alongside them, we are anticipating a start for Ross Barkley ahead of Mateo Kovacic, given the Englishman offers more in terms of going forward. In the attack, Eden Hazard could slot into his preferred left-wing role for the derby after being ineffective in the false nine role of late. 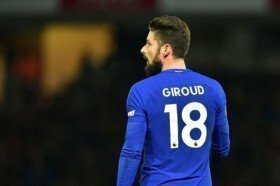 In the opposite flank, Pedro could get the nod ahead of Willian, who had a forgettable game against the Gunners while Olivier Giroud could be tasked to lead the line.